The Hemingway Letters Project is producing a comprehensive scholarly edition of the author's some 6,000 letters, approximately 85 percent of them never before published. The edition is being published by Cambridge University Press in a projected seventeen volumes. The project is authorized by the Ernest Hemingway Foundation/Society and the Hemingway Foreign Rights Trust, holders, respectively, of the U.S. and international rights to the letters. We are particularly grateful to Patrick Hemingway, who originally conceived of a complete scholarly edition of his father's letters and who has been most generous and supportive of this effort. 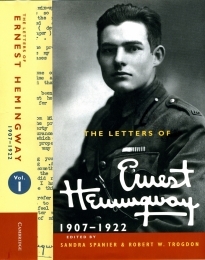 The Hemingway Letters Project has been supported in part by grants from the National Endowment for the Humanities. Early on it was designated a We, the People project, “a special recognition by the NEH for model projects that advance the study, teaching, and understanding of American history and culture,” and the Letters Project is currently one of two featured "NEH for All" projects for the state of Pennsylvania. Most recently the Letters Project was awarded a Scholarly Editions Grant for 2018-2021. Here is a video featuring Patrick Hemingway speaking about the letters. The series was launched in September 2011 to widespread popular and critical attention. Volume 1 (1907-1922) is edited by Sandra Spanier and Robert W. Trogdon, with associate volume editors Albert J. DeFazio III, Miriam B. Mandel, and Kenneth B. Panda, and volume advisory editor J. Gerald Kennedy. Linda Patterson Miller contributed a Foreword. Volume 2 (1923-1925) was published in October 2013, edited by Sandra Spanier, Albert J. DeFazio III, and Robert W. Trogdon, with associate volume editors Miriam Mandel and Rena Sanderson. Volume advisory editor J. Gerald Kennedy contributed an Introduction to the volume. Volume 3 (1926-April 1929) was published in October 2015, edited by Rena Sanderson, Sandra Spanier, and Robert W. Trogdon, with volume advisory editors J. Gerald Kennedy and Rodger L. Tarr. Work on Volume 5 (1932-May 1934) is progressing with a projected publication date of fall 2019. Volume 5 is edited by Sandra Spanier and Miriam Mandel, with associate volume editors Albert J. DeFazio III and Krista Quesenberry. The project is progressing in close consultation with a distinguished Editorial Advisory Board, headed by Linda Patterson Miller and including Jackson R. Bryer, Scott Donaldson, Debra Moddelmog, and James L. W. West III. An international team of scholars serves in a variety of roles, including as editors of individual volumes and as expert consultants. We also have called upon the local expertise and specialized knowledge of numerous other Hemingway scholars and aficionados. 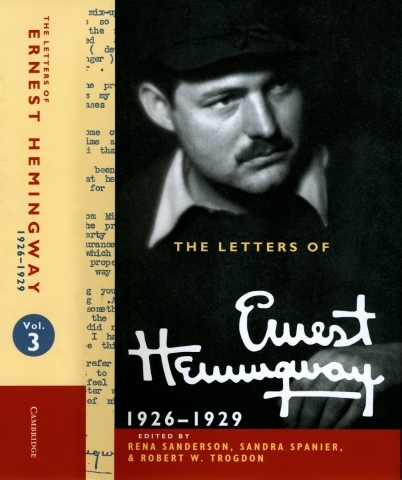 Because Hemingway's letters are widely dispersed and he did not routinely keep copies, a major challenge has been to track down and obtain copies of the extant letters. To date we have gathered copies of letters from some 250 sources in the United States and abroad: more than 70 libraries and institutional archives, and scores of dealers, private collectors, Hemingway correspondents, and their descendants. The largest repository, the Hemingway Collection of the John F. Kennedy Presidential Library, has generously donated copies of its entire holdings of some 2,500 outgoing letters. Selected later volumes will feature a section of “Additional Letters” for those that come to light after publication of the volumes in which they would have appeared. As we aim to make this edition as complete as possible, we will greatly appreciate any information that would assist our efforts to locate letters in private hands or in other collections that we might otherwise overlook, particularly those outside the United States. We are seeking only copies of letters and gladly will reimburse owners for scanning or copying and mailing expenses. Many individuals and institutions around the world have kindly shared photocopies or scans of their letters for our master archive. Contributors will be gratefully acknowledged in the published volumes, unless they prefer to remain anonymous. The project is headquartered at The Pennsylvania State University. Our staff includes Associate Editor Verna Kale and Assistant Editor Jeanne Alexander. Other personnel include graduate research assistants Danielle Carder and Katie Warczak, and project assistants David Eggert and Linnet Brooks. We appreciate the contributions of former graduate and postdoctoral research assistants, most recently Michael Hart, Juliette Hawkins, Michelle Huang, Jace Gatzemeyer, Leslie Joblin, Bethany Mannon, Justin Mellette, Krista Quesenberry, and Sean Weidman, as well as undergraduate interns who assist in daily operations. In addition to the crucial institutional support provided by Penn State University, we are also most grateful for the support of individual donors and for gifts and grants from AT&T Mobility, the Heinz Endowments, the Michigan Hemingway Society, the Dr. Bernard S. and Ann Re Oldsey Endowment for the Study of American Literature in the College of the Liberal Arts at Penn State, and the Xerox Corporation, which has contributed copying, printing, and scanning equipment as well as a DocuShare database management system that has been customized for our needs. Many already have been most generous with their time, expertise, and financial support, as well as with Hemingway treasures in their possession. We are grateful to all who have been and will be contributing to this exciting and historic effort. Please be in touch with questions, suggestions, and leads. A literary treasure trove . . . Where Hemingway’s published works had all been so deliberate and painstakingly chiseled, his letters were free-form and expansive—unsanded and unvarnished. . . . His letters may prove to be the most honest log of Hemingway’s fascinating life-voyage, the truest sentences he ever wrote. . . . Their value cannot be overstated. “The Letters” is without question a spectacular scholarly achievement. 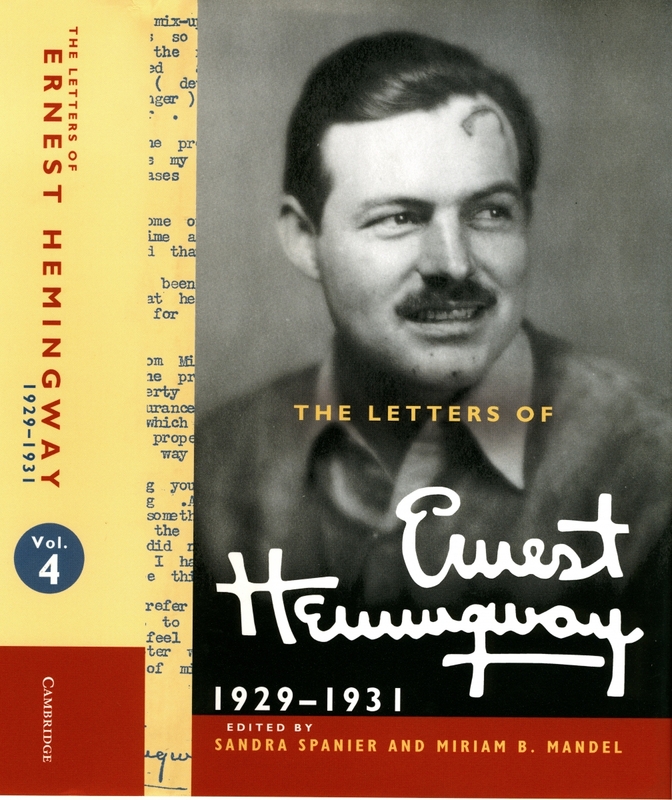 This Cambridge edition of all of Hemingway’s known letters is as elegant and proper a solution as one could wish to a daunting challenge: how to make this treasure available to all interested scholars and readers for generations to come. I think that Papa Hemingway would be pleased. His favorite dictum seems most fitting on this splendid occasion: “Il faut, d’abord, durer.” (“First of all, one must endure”; or as my Dad translated it with supreme economy: “First: last.”) Along with his books, Hemingway’s most personal thoughts and expressions will now endure beyond his wildest dreams. This first, magnificently edited volume...is a work of true literary scholarship. Those familiar with the gruff, humorless, and word-chary sportsman of popular legend will be surprised to find a charming and compulsive correspondent whose garrulous voice works irresistible magic on the English language. This essential volume, beautifully presented and annotated with tremendous care and extraordinary attention to detail, offers readers a Hemingway who is both familiar and new. This expertly edited and annotated volume will be devoured by fans eager to learn how the literary titan came into his own. 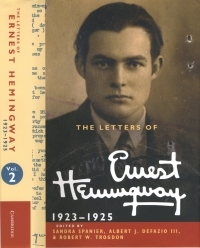 The newly published letters are bracingly energetic and readable, and they add depth and detail to the already vast biographical record of Hemingway’s early years. Roughly written as they are it is fascinating to watch the private rehearsal of what would become public performances. The publication of Ernest Hemingway’s complete correspondence is shaping up to be an astonishing scholarly achievement. . . . Meticulously edited, with shrewd introductory summaries and footnotes tracking down every reference, the series brings into sharp focus this contradictory, alternately smart and stupid, blustering, fragile man who was also a giant of modern literature. Reading Hemingway's letters is to go back in time by stepping into the fascinating world of a revolutionary wordsmith; a voyage through decades to the very moments when literature was taking a sudden bend in the road . . . Indeed, the value of these letters cannot be overstated. Volume 3 (1926-1929) is another stellar contribution to a series of grand scope and vision, executed with rigorous professionalism, and resulting in a deeply satisfying volume for the reader and an unsurpassable resource for the scholar. "[A] windfall for Hemingway fans, but also for those trying to understand the daily working life of a major writer [...] Editors Sandra Spanier and Miriam B. Mandel are comprehensive and meticulous in their approach--the book is peppered with contextual footnotes that moor the letters--and the result is real insight into a stubborn, driven, accomplished writer." "The project is a remarkable feat of scholarly endeavour [...] The sheer fun of this series is that it seats the reader right in Papa's chair"